The Cleveland rotisserie oven is available in two sizes built to hold 28 or 32 chickens – cooked to perfection in just 90 minutes! Cleveland manufactures a complete line up of steam jacketed and mixer kettles. From table top to floor models available in gas or electric. Cleveland is hands down the leader in steam cooking equipment. From traditional to boilerless, full size to counter models there is a complete line up to choose from. Convotherm by Cleveland features the industry’s largest selection of models in both gas and electric and the world’s smallest combi oven – the Mini. See the complete line up here. Welbilt Foodservice offers a full range of cooking equipment and solutions from its portfolio of leading brands. Cleveland/Convotherm for steam and combi ovens, Frymaster for emersion cooking, Merrychef for accelerated ovens, Garland for innovations in cooktops and so many more. Frymaster’s single basket fry dispenser is the ultimate for saving time and labor. Its design allows for increased fry yield and provides high quality, consistent and reliable performance, time after time. It dispenses a single basket of french fries instantly, allowing greater speed of service to customers during rush hours. Garland’s / US Range’s Heavy Duty Gas Counter Series offers a modular approach for improved kitchen operations and equipment flexibility. Side by side, they make an impressive high performance line up balanced with power, durability and style evident in every detail. Quality craftsmanship built into every fryer. We offer gas and electric models for range or counter match options. The open fry pot design offers easy access for maintaining and cleaning fryers. Garland makes a complete line of high-quality griddles and grills – from countertop to full size models for light, medium or heavy duty operations. Garland offers a variety of baking, roasting, pizza and convection ovens. Ovens virtually for every application. Power, precision and efficiency – get exactly what you need from Garland’s complete line of light, medium and heavy-duty ranges. Dozens of range top and bottom configurations available. The benefits of cooking with induction are enormous – unparalleled precision, efficiency, speed and energy savings. And, because it’s made by Garland, you know that every component has been designed with commercial foodservice in mind. Quality and durability perfectly balanced with convenience, flexibility and efficiency. Lincoln makes one of the industry’s best conveyor oven platforms. Fast, reliable and now with Quest Energy Management System – efficient too. Lincoln CTI (Counter Top Impinger) and Garland half-size convection ovens. Solutions for the power you need in a footprint that makes sense for your operation. If you want to speed up service without sacrificing food quality then check out the complete range of accelerated cooking ovens by Merrychef. Merrychef was one of the first commercial food equipment manufacturers in the world to apply microwave technology to cooking. Anyone who has ever worked with a Convotherm knows how their pioneering products inspire better food preparation. “Your meal. Our mission.“ is their philosophy born out of the passion and commitment to provide the best combi steamer solutions that answer the varied needs of their customers. The new Convotherm 4 range of combi steamers brings style into the professional commercial kitchen. From first glance, this oven combines world-class technology with user-friendly, ergonomic and hygienic design and all models share the same logical and intuitive system of operation: a real plus in the often hectic daily life of foodservice. Their new combi steamers inlude seven sizes of ovens, each with six different model options. The result is a combination of functional versatility and consistent design that is revolutionary in this product category. Passion is behind every Convotherm combi steamer: passion for excellence, for creativity, for practical partnership – and for making customers more successful each and every day. Imperial utilizes highly skilled employees combined with innovative manufacturing processes. Imperial continually invests in state-of-the-art technology and machinery as part of the commitment to future growth. This provides enhanced efficiencies, lower production costs and consistent top quality equipment. Grindmaster-Cecilware™ supports the foodservice business operator where it counts the most… in the field. With a product line of exceptional value and performance, Grindmaster-Cecilware™ offers a range of commercial cooking equipment that meets your customers’ needs while delivering the exceptional performance required by commercial and institutional operations – no matter what their size, no matter what they serve. Amana Commercial high-speed cooking products help thousands of foodservice establishments cook smarter and faster. Designed to help operators reduce prep time, increase efficiency and improve overall food quality, Amana high-performing ovens have become critical, energy-efficient equipment in today’s busy foodservice environments. As the only American-based commercial microwave manufacturer, ACP has the ability to customize product and provide unique solutions for every foodservice need. Amana Commercial microwave ovens are, by design, one of the most efficient appliances found in commercial foodservice kitchens. Since microwave ovens require no preheating and heat only the food being cooked, operators receive significant energy savings when compared to standard ovens. By using a high powered Amana Commercial microwave oven to bulk heat foods such as baked beans or to steam vegetables, operators can cut their equipment energy costs in half compared to using an electric countertop steamer for the same tasks. Amana combination ovens, which combine microwave energy with other proven cooking technologies, also offer energy savings over traditional equipment. With cooking speeds of up to 15 times faster than conventional methods, operators can cook more in less time while using less energy. From microwave ovens for light volume vending sites to high-speed, heavy-volume microwave steamers, Amana Commercial microwaves have you covered. Amana ovens offer the most complete line of commercial microwave and combination ovens to fit virtually every foodservice need. Maximize your menu versatility and your floor space! With NEMCO’s ingenious equipment, you’ll never see such a small footprint deliver such a kick to your kitchen offering! NEMCO’s ovens, fryers and boiling units are engineered to heat up in minutes and recover super-fast. Plus, the even heat distribution delivers a superior cooking performance your customers will crave. Prepare for the rush times by cooking and cooling portions in advance. NEMCO’s countertop ovens and pasta cookers are perfect for reheating and reconstituting all sorts of foods. If it’s NEMCO, you know it’s dependable. Every countertop oven, fryer and boiling unit is designed for easy operation and easy cleaning with stainless steel construction and performance-tested components that deliver a tremendous return on investment. In 1991, Bill launched Crown Verity – a company focused on providing high quality commercial kitchen equipment to food service professionals. Manufacturing barbecue grills, patio heaters and portable sinks, Crown Verity emphasizes versatility and transportability in all its products. Crown Verity’s name and location continue the tradition of a century-long business connection between the Verity family and the city of Brantford, Ontario. Since 1950, Hatco has been a leader in creating innovative ideas for the foodservice industry: bold innovations in equipment that improves efficiency, reliability and profits. Hatco products are designed and built to handle the rugged demands of today’s foodservice operations. Hatco manufactures durable warming, toasting, sanitizing, and refrigerated equipment with a dedication to exceptional customer service and worldwide distribution. The company is headquartered in Dallas, Texas, and operates manufacturing facilities in Cheyenne, WY, and Nogales, Mexico. APW Wyott is a member of the Standex Cooking Solutions Group, along with other well-known brands, including Bakers Pride, BKI, Bevles, and Tri-Star. For over 30 years, L. Vasan, President of Royal Range of California Inc., has been designing commercial and residential gas cooking appliances. During the two decades of experience, Vasan provided the industry “icons” cutting edge technology. He was involved in designing and developing new products and adding features on the existing products for most of the industry’s major commercial cooking appliance manufacturers. Vasan is associated with many of the industry’s key patents and continues to add innovative technology yearly. L. Vasan brought his vast experience in design/manufacturing to Royal in 2003. Since then he has transformed Royal by significantly improving the quality of the products. He has introduced new features and developed new equipment for a broad line of products that include ranges, a complete array of convection ovens, fryers and a full complement of countertop cooking appliances. Virtually every product in the Royal catalog has been methodically tested and reviewed for potential improvements. Cost is secondary to performance which is refreshing in a world dictated by value engineering and foreign manufacturing. Royal is now located in a modern 52,000 square foot facility in Eastvale California. All R&D is done on site. Royal’s latest products include a Thermostatically Controlled Infrared Radiant Broiler which saves the user 23% BTU/hr. while increasing production capacity 24%. Bakers Pride® restaurant equipment is trusted by professional chefs and operators for longevity, quality and energy efficiency. 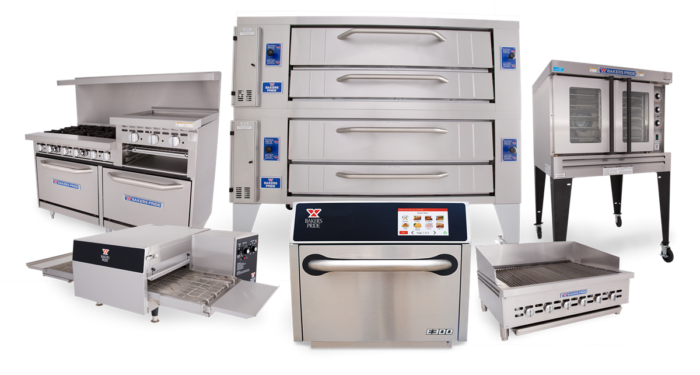 Explore all the cooking equipment options we offer to stock your kitchen including our world famous reliable ranges and charbroilers, compact conveyor ovens, and our incredibly fast speed ovens.